Using Twitter From Command Line Interface not only has the advantage of minimalistic text only mode but also a clutter free way to smooth the workflow. Before reading this guide for using Twitter From Command Line Interface, please vide the needed setup for your command line tool; either Mac, Linux or Windows from this article Using Facebook From Command Line Interface. We would not repeat the way to setup the command line for using Twitter From Command Line Interface again; please setup the needed things properly. Otherwise obviously no trick will work. 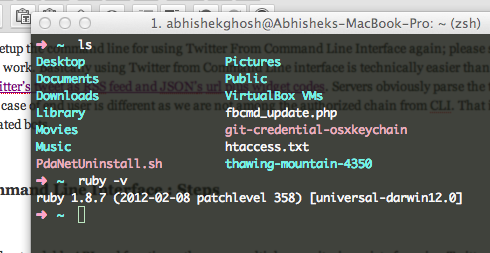 Basically using Twitter from Command Line interface is technically easier than Facebook. We actually have done it before in other way : Get your Twitter™s tweet as RSS feed and JSON™s url plus widget codes. Servers obviously parse the things as binary and that means as command lines. The situation in case of end user is different as we are not among the authorized chain from CLI. That is why we need an Auth code or API to make sure that we are not automated bots. If you find the second one pathetic, you can use the first one. The reason we mentioned both due to the reason, some might not love using Ruby Gem. It sounds odd, but we got such comments before ! This Article Has Been Shared 6206 Times! VDSL2 (Very-High-Bit-Rate Digital Subscriber Line 2) is a digital subscriber line with high transfer rate, which leverages existing telephony infrastructure. Subnet combines multiple successive IP addresses using a subnet mask to binary boundaries under a common front. In case of IPv6, it is called the prefix. In this Article, we have explained the Most Common Terminologies in Revision Control System which are in current usage and important to software developers. Internet of Everything might be the new industrial revolution as long as we can fill the gaps on the security of networks and training part. Cite this article as: Abhishek Ghosh, "Using Twitter From Command Line Interface," in The Customize Windows, December 20, 2012, April 24, 2019, https://thecustomizewindows.com/2012/12/using-twitter-from-command-line-interface/.